In May 2012, God prompted me to leave a church I loved. I had been active and involved in leadership for more than 12 years, but He said, "That's enough. You're done here." Previously, I shared how I tried to ignore God and carry on and how that didn't work. Reluctantly, I took the leap of faith God had whispered, then chanted, then billboarded and began the task of finding a new church. I did not take this search lightly because I know the value of the local church in my life. Some of you have possibly experienced great hurt in the sanctuaries that should be rooms of restoration. Perhaps the church is a source of pain rather than healing. However, for me, the local church has always been a source of joy and rest and relationships that matter. Don't get me wrong, there have been CUH-RAZIES in those fellowship halls and Sunday school classrooms. But for the most part...life-giving. Being separated from the local church for a season, even by choice, birthed an anxiety in me. Since I'm not a fan of worry or waiting, I put the pedal to the metal. Over the course of seven months, I visited 11 churches in the metro Birmingham area and narrowed it down to three and then to one. What did this process look like? It looked just like The Bachelor. An eligible person and a pool of romantic interests. There were connections, conflicts, and dramatic twists. There were eliminations and a final rose. 1. Make A List of Qualities You're Looking For: I've always preferred to date folks who are emotionally healthy (LIKE ME) so I thought the same should be true for my church. What makes a healthy church? Charles Stanley provides a few characteristics I used in my search. Bible-centered: Not events-centered, not works-centered, not pastor-centered, not casserole-centered. As much as I might fancy that last one. Spiritual: This is such a wonky overused term, but in this case it means an emphasis on a personal relationship with God. No middle man. Evangelistic: It's crucial when a hungry person finds bread that he tell other starving folks where he got it. A healthy church has structure for doing this. Bonus? If they have actual bread in the form of breakfast pastries. Influential: A church should be impacting its community for good. That impact should be obvious and measurable. Friendly: Let's not pretend all churches are packed to the brim with kindness. There's a reason it was easy not to visit some places on my list a second time. SMILE AT ME GREETER PERSON. Growing: This isn't just about numbers. But that doesn't hurt. It's also about members growing in their faith, their heart for others, and ability to transform the big and small world around them. 2. Play The Field: I needed to go on lots of dates. I wanted to learn as much as possible about a church and one visit wasn't always enough. Plus, it's important to take time to compare and contrast so you don't get swept up by free coffee and cushy seats. 3. Ask God for a Spouse: If ABC spent more time encouraging their contestants to pray about the roses they're passing out, then I'm sure we'd have more actual happily ever afters. Every time I visited a church or its website or emailed a staff member, I prayed. God wants us in the place He wants us. He has no interest in hiding that tidbit of information from us. 4. Make a Commitment: Beyonce is right. You need to put a ring on it. The idea of living out your faith on your own is not enough. The accountability and responsibility to the people of God found in the local church is such a snazzy thing. 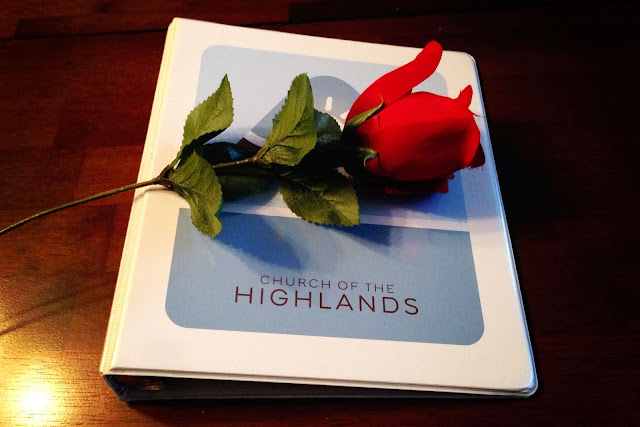 I'm about to celebrate my one year anniversary with my "final rose" church. Chris Harrison could not have narrated a better ending. Have you ever tried finding a new church? Finding a new love? What are your tips for both?